PT. 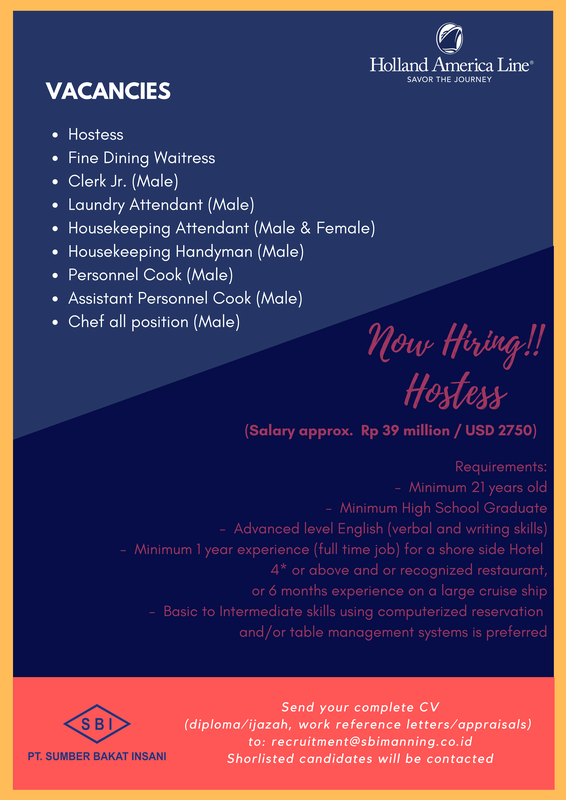 Sumber Bakat Insani, (SBI) is a well established Seafarer Recruitment and Placement Service in Indonesia that has commitment to always enhance customer satisfaction for our principals. Continuous improvement to our highly developed system is our key to be more efficient and effective. 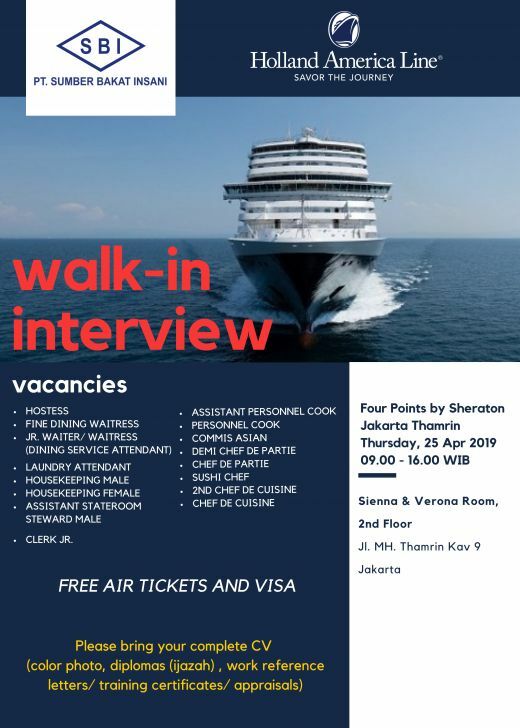 We are the only manning agent for Holland America Line in Indonesia. We offer not only the vacancies at the cruises industry but also the certainty of continuous career deployment and enhancement. To stay competitive in fast evolving industry, we continuously update and improve our services to meet our principals needs. This website provides various useful information, and guidance to those who have dream of being a high qualified seafarer to sail around the world on one of our principal's cruise ships. We thank you for visiting our website. Have a wonderful day! Click link on Position or See detail to see vacancy detail. PT. Sumber Bakat Insani will commencing walk in interview. Address : Jl. MH Thamrin Kav. 9. Date : April 25, 2019. Click image below for further details. Visit our Job Vacancy page for more information. 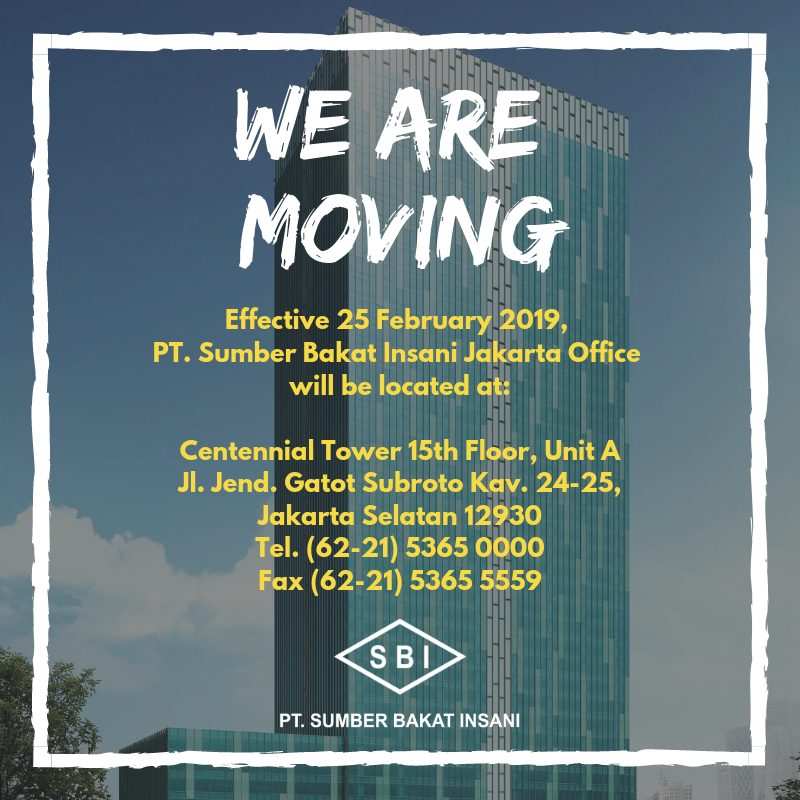 SBI Jakarta office will be closed down tomorrow, Friday 22nd February due to we are relocating to the new office. See you on Monday 25th February at Centennial Tower! licensed to PT. Sumber Bakat Insani. Website content are copyrighted © PT. Sumber Bakat Insani. 2006 - 2019. All right reserved.